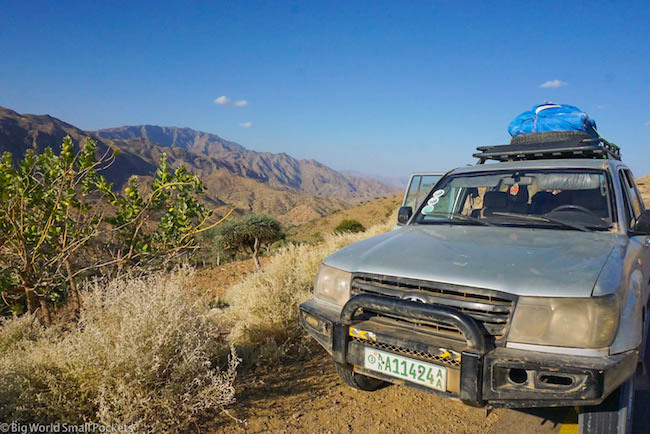 Arriving into Ethiopia’s Makele airport, I’m met in the parking lot by a 4wd that screeches to a halt in front of me as 3 smiling guys grin at me out of the window! “Are you Stephanie?”, they ask. I nod, and with that, their bundling my bags into the boot of the vehicle, me into the back and we’re off! As one of them drives, one of them sorts the music, the other turns to me and welcomes me to Makele! “Get ready for the time of your life” he tells me in excellent English accented by that beautiful Ethiopian lilt, before quickly running me through the itinerary of my forthcoming 4 days… of which I remember nothing! Then he’s jumped out of the car and I’m left with the 2 others guys as we speed through the city of Makele. All of a sudden the city is behind us and the landscape is becoming increasingly barren and desolate. 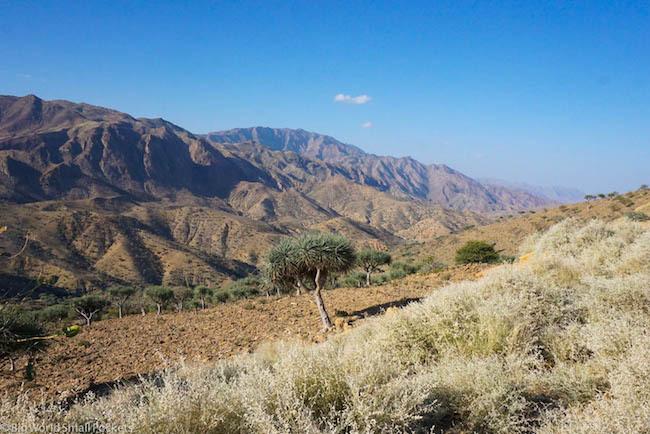 Huge craggy cliffs sweep past, as the odd villager, donkey in tow, trudges silently along the dusty road. And it’s only 15 minutes since we left the airport! 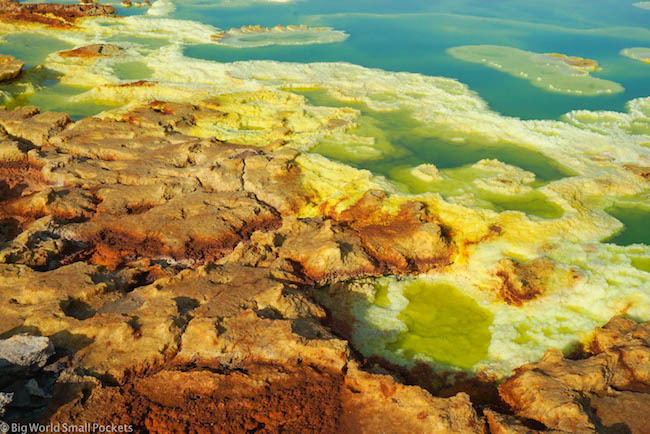 Welcome to Ethiopia’s Danakil Depression, one of the most inhospitable places on earth… and one of the most AMAZING!! 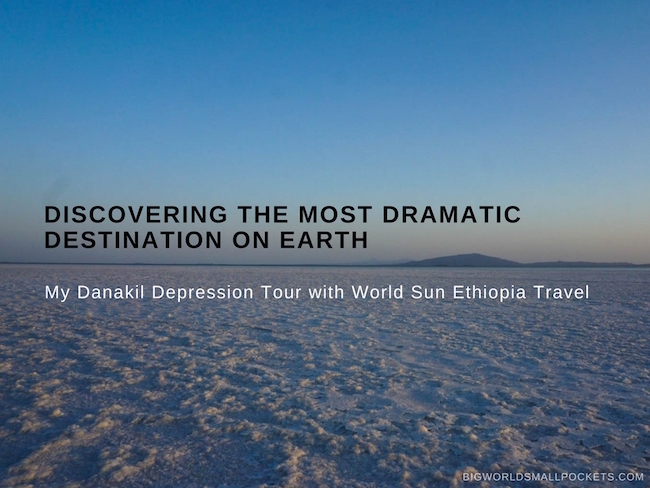 And welcome to the experience of travelling with World Sun Ethiopia, the best Danakil Depression Tour company I could have wished for! 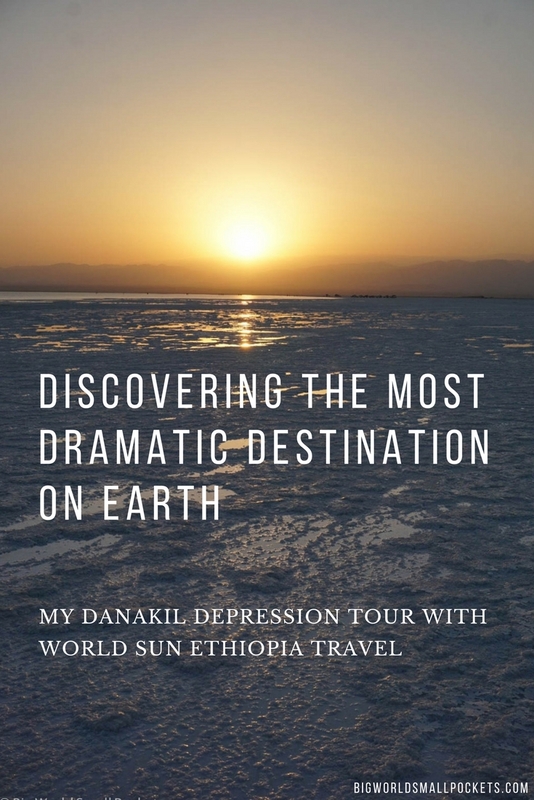 My trip to the Danakil Depression with World Sun Ethiopia Tours was kindly sponsored, but, as always, all view are my own. 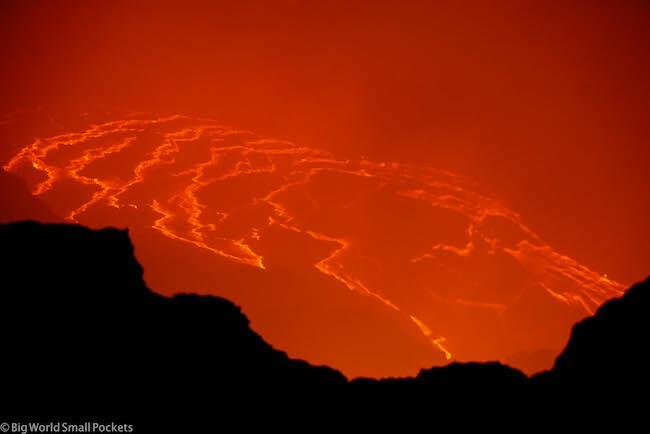 So What is the Danakil Depression? 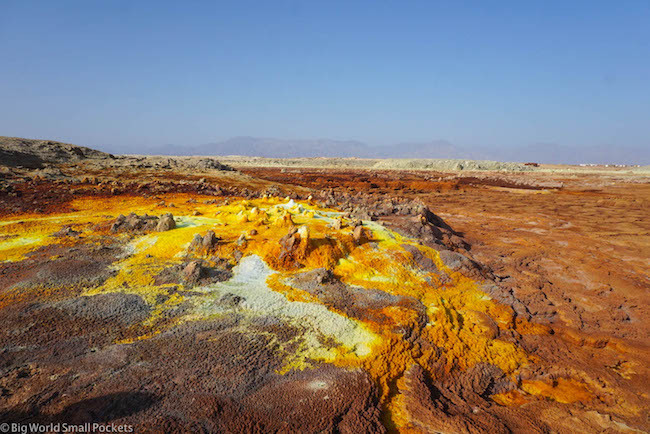 To fill you in a little, the Danakil Depression is a huge lowland area in Ethiopia’s northeast, which skirts close to the border with Eritrea. 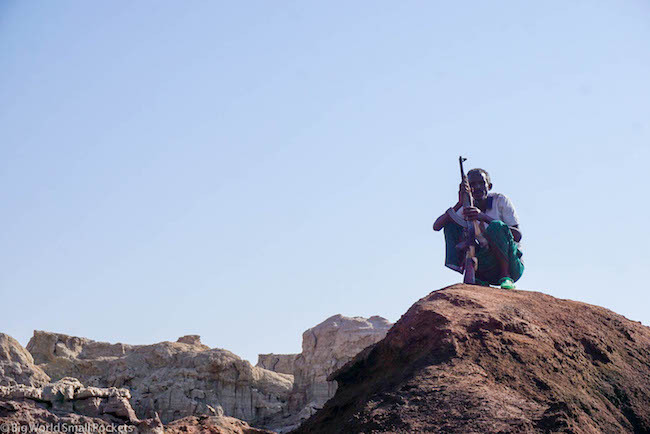 It is part of the country’s Afar Region, largely a remote, desert landscape occupied by the Afar people, a distinct ethnic group who eke out a semi-nomadic living in this, one of the toughest, driest and hottest places on earth. 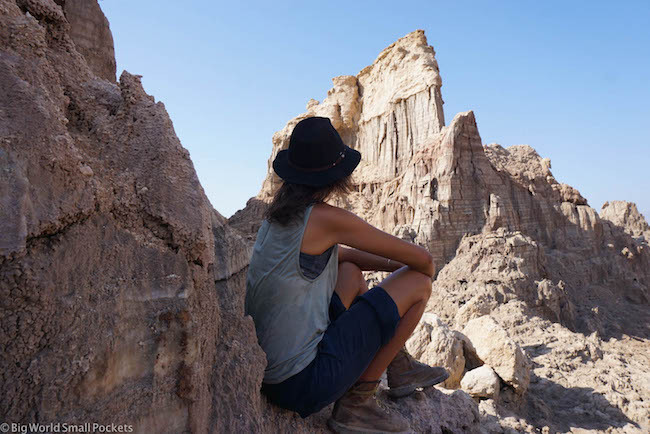 Sitting largely below sea level – in fact, it’s one of the lowest places on earth – this is an otherworldy location, a wild and weird landscape, not for the fainthearted, but breathtakingly dramatic and jaw-droppingly different as a result. 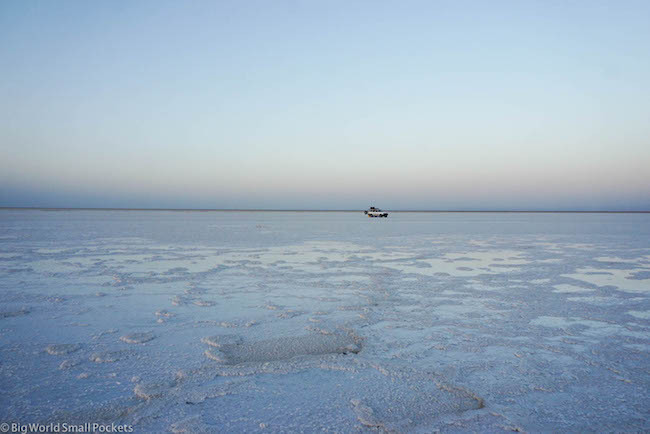 Shaped by tectonic activity it features active volcanos, huge salt lakes and extreme sulphur springs that jostle together in an environment that feels, quite frankly, like it doesn’t belong on earth. As such, travelling here is a similarly otherworldly experience! LOOKING FOR A BUDGET TOUR IN AFRICA? If you’re interested in an unforgettable, well-priced tour in Africa with guides you can trust, then email me at steph@bigworldsmallpockets.com with details of where you want to go and I’ll send you my top recommendations – simple! Because let there be no misunderstanding here people, this is adventure travel to the max; rough, ready and like nothing else you will ever experience in your life! Sleeping under the stars, enduring some crazy temperatures, hiking to volcanoes night and speeding across salt flats, this is no plain sailing! And travelling in this area is also not without its dangers. Armed guards are required at points and vehicles must generally be in conveys. But amongst all these difficulties, World Sun Ethiopia Tours were professional to the core. I felt in the safest of hands as their experienced staff organised everything, answered all our questions and were incredibly patient. When you go to the Danakil, and see just how far off the beaten track this place is, you quickly realise the logistics and costs involved in making such an excursion, and with World Sun, I felt this was brilliantly managed alongside the usual chaos and calamities travelling in remote Africa involves. 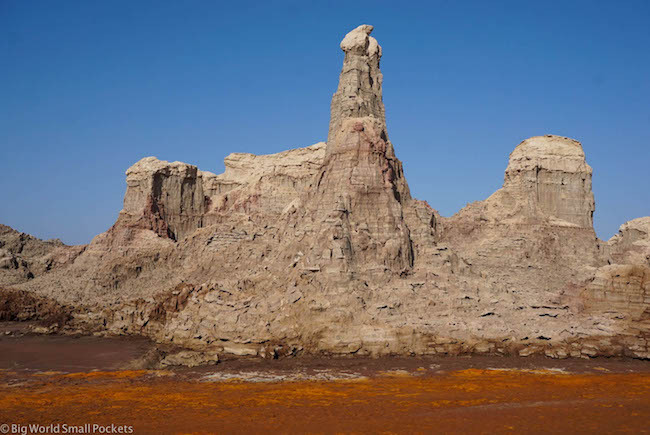 Based in the city of Makele – the nearest point of “civiliation” to the Danakil Depression – World Sun Ethiopia Tours is run by the wonderful Negasi. Having lived and guided tourists in this area for many years, he is incredibly experienced and offers visitors the chance to sample 3 or 4 day tours in one of the craziest places on earth! 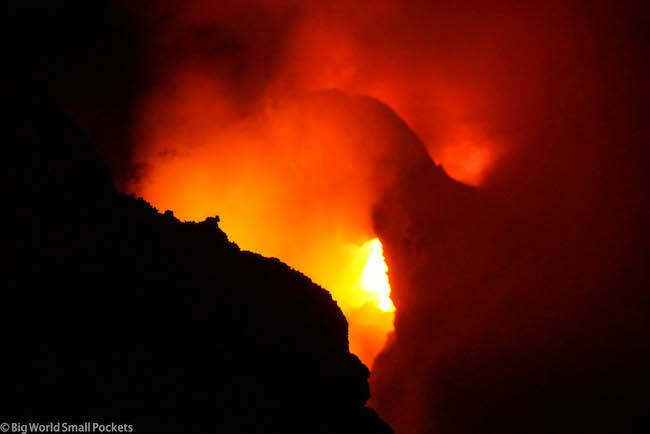 Included in his tours are a night hike up Erta Ale – an active volcano – whose crater you can stare down into and view bubbling lava as it pops, hisses, boils and explodes not 60m below you. 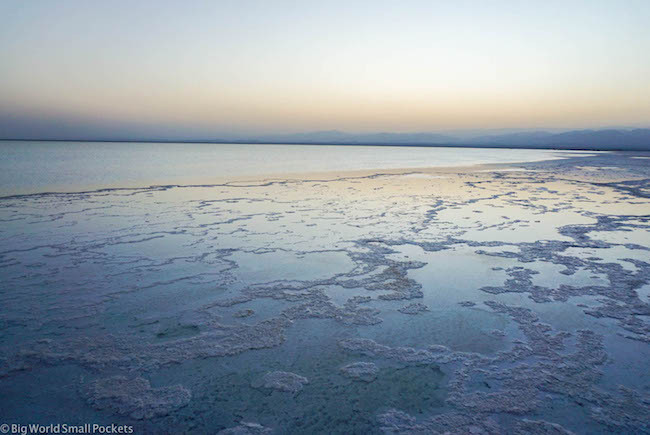 Then there’s the drives to the salt lakes of Afdera and Asale, where you can enjoy the most buoyant swim of your life before rinsing off in a nearby natural hot spring, as well as the chance to see an incredible sunset sprawl across a huge salt flat. 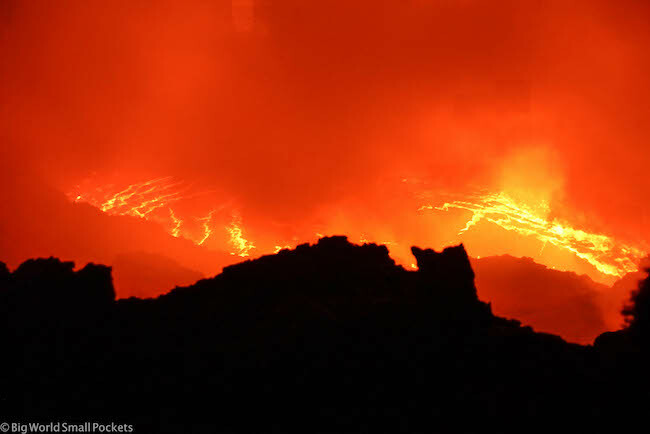 If you’ve seen any pictures of the Danakil Depression, it’s likely the ones of Dallol are those seared into your memory. These steaming sulphur springs stink, of course, but also look like you might imagine another planet does as their boiling gas and rich mineral content creates a landscape of bonkers colours and formation. 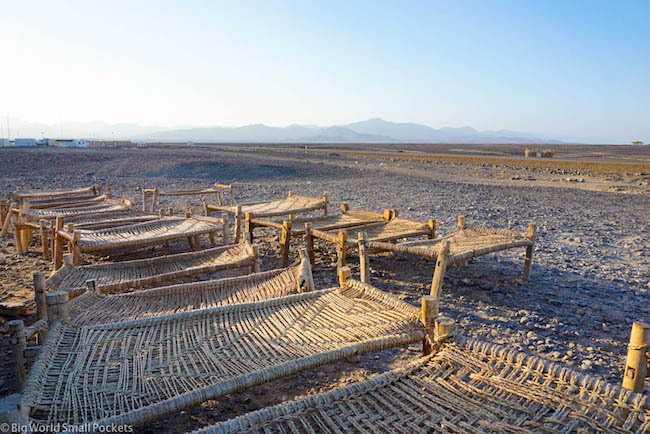 In essence, the 3 and 4 day World Sun Danakil Depression Tours allow you to see the same attractions, the only difference being that the 3 day groups cram more into a shorter time and have one less night. 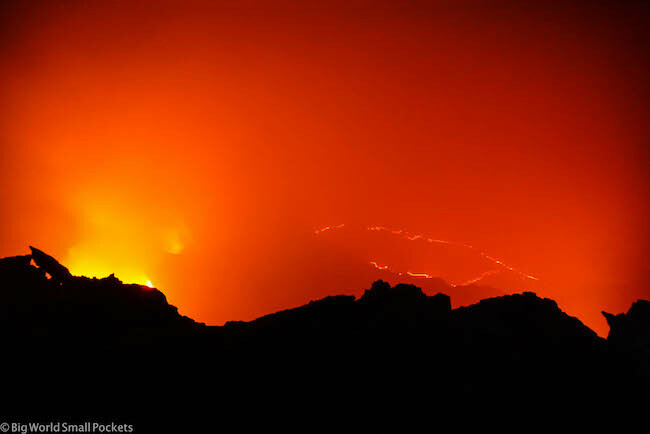 And trust me, once you get to the Danakil you will want another night there! #1 Headlamp – An absolute must for climbing the volcano. I always recommend Black Diamond – the best brand for travel. #2 Hiking Boots – Again a must for the Erta Ale Volcano and Dallol, I think the Keen Targhee II are a great pair to go for. 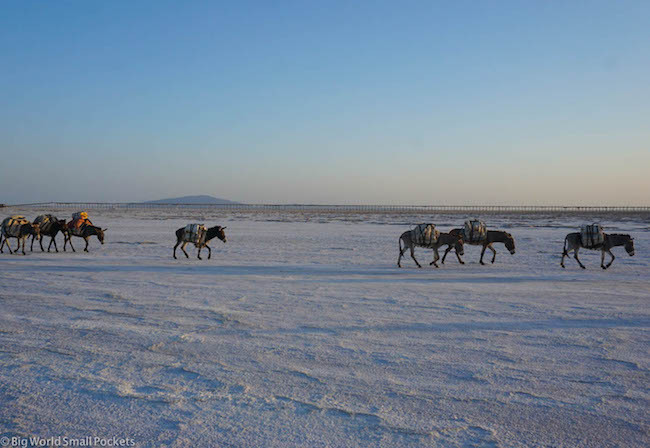 #3 Sleeping Bag – World Sun Ethiopia did provide us with blankets, but it does get cold at night in the Danakil and I was really glad of my Snugpak Travelpak sleeping bag. #4 Scarf – That sulphur and volcano dust gets smelly and makes you cough. 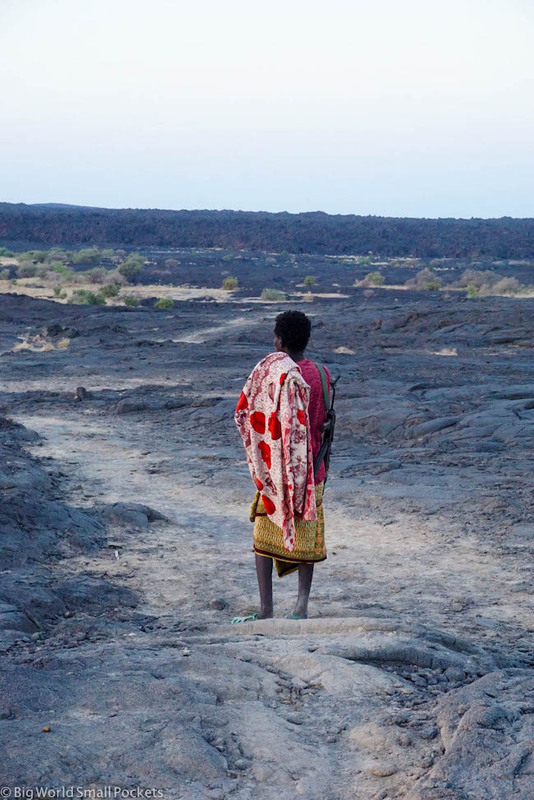 Taking a travel scarf, sarong or buff with you to Ethiopia’s Danakil is therefore a must. #5 Swimsuit – You won’t be able to resist jumping in Lake Afdera, so make sure you pack something you can enjoy the salty water in. #6 Toilet Paper and Baby Wipes – With few to no facilities, these 2 items are essential! #7 Suncream and Sunhat – For obvious reasons guys, this is the hottest place on earth! I was lucky enough to experience a 4 day tour with World Sun Ethiopia, which, like my first 15 minutes with the company, flew by in a flash! 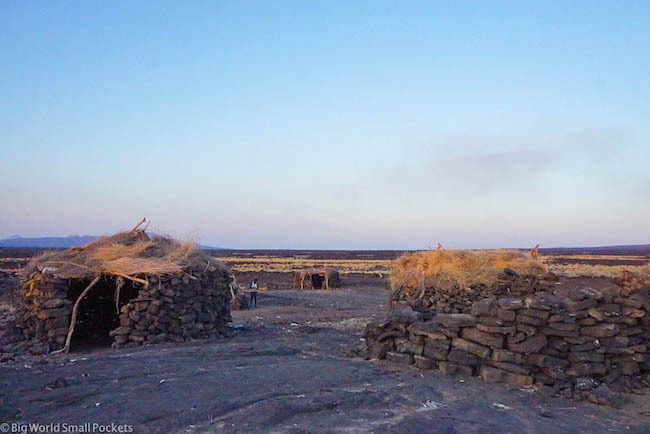 We started on Day 1 by driving from Makele to the famous Erta Ale Volcano, a 5 hour drive, which saw us stop for lunch in an Afar village on the way. After reaching the base camp, we got ourselves organised for the night trek up the volcano and then ate a delicious dinner under the stars. Before we knew it, and with headlamps at the ready, we began our ascent at around 7pm. Making this trek in the dark was a very atmospheric experience, but even with the sun having gone down, the heat of the day still persisted. Hiking boots were a must, as well as lots of water, but although it took us 3 hours, the hike was relatively easy and the full moon meant seeing our way was possible even without our torches. Reaching the crater of the volcano was like nothing else I’ve ever experienced and we stayed over an hour there, marvelling at nature in its rawest form, taking countless photos and drinking Ethiopian wine our guide brought with him! Drunk on the joy of it all, we finally scrambled under our blankets just a few 100m away from the volcano and slept under the stars of the beautiful Danakil Depression. Waking up at 4am, we began our descent down the volcano and, despite having only had a few hours sleep, were glad of the early start as soon as the sun began to peek its head over the horizon and the heat of the day began to stir. Reaching base camp again we were able to organise our things and eat a delicious breakfast before cowering in the shade and then making our departure. 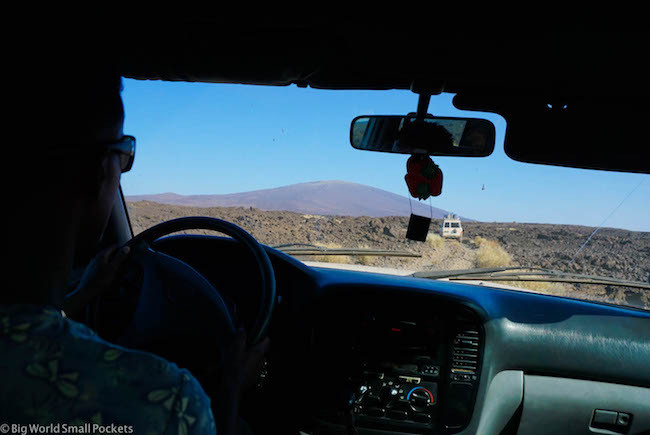 Then we were speeding back across the crazy volcanic landscape – a rough 4wd journey of unimaginable proportions – before making our way to Lake Afdera. 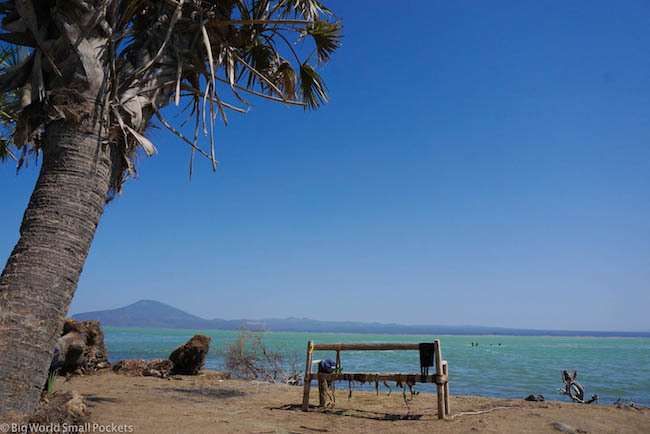 Taking a dip in this salt lake felt SO good, as we floated and washed some of the volcano dust off us, before rinsing off in a scorching hot natural spring pool alongside. Lunch in a nearby village followed before we made the long drive – thankfully on asphalt and with the most incredible dry mountain scenery – to the town of Abala. A simple, local guesthouse here was our destination for the night, as again we ate dinner under the stars and relished the chance for a bucket shower and the power to charge our cameras. With the 4 day tour, we had a good morning to relax at the guesthouse and enjoy a leisurely breakfast and traditional Ethiopian coffee ceremony, before heading into the town to explore and sample a local beer. 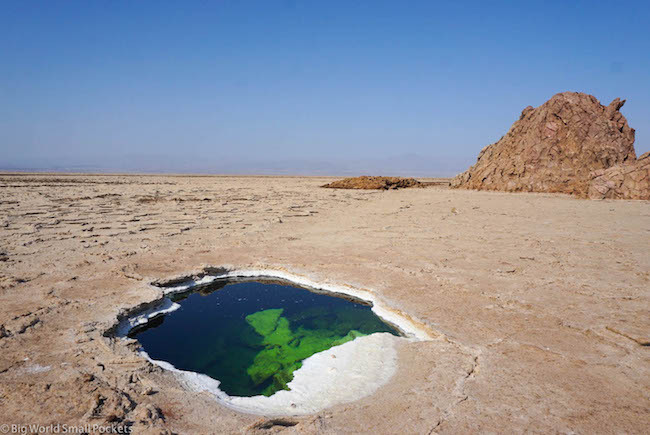 Then we were back on the road, speeding to a different part of the Danakil Depression, and perhaps its most spectacular in my opinion… Lake Asale. 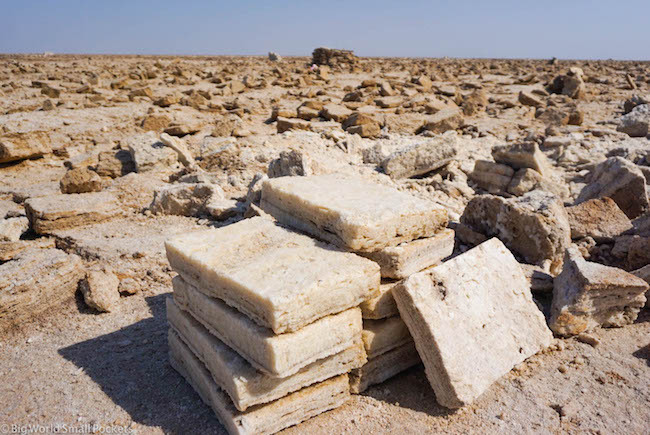 Lunch was enjoyed in the local Afar town of Berhale, while traditional camel caravans trudged past, carrying mined blocks of salt to market. 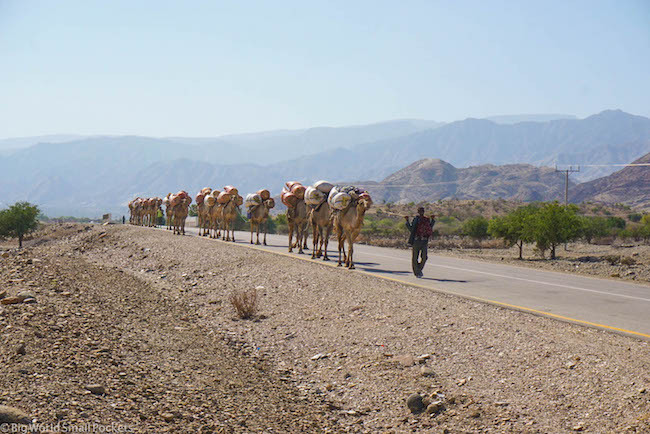 Like something out of a forgotten era, the sight of long lines of camels and their herders, slowly making their way through this dry, arid landscape, felt like a lost world we were lucky enough to get a glimpse of. 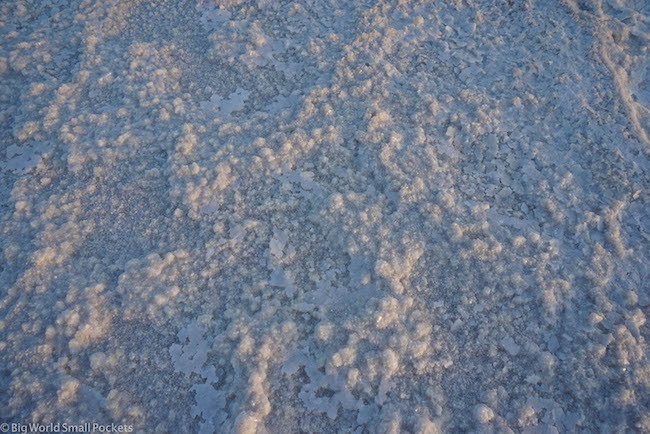 Then, just as the sun was going down, we made it to the giant salt flat of Lake Asale. 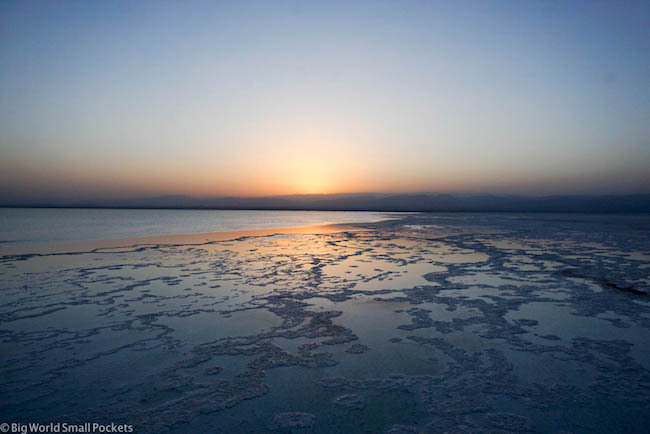 As the salt spread before us like an icy landscape, we said goodbye to the close of another incredible day listening to Ethiopian music and drinking local wine as the sun radiated her incredible colours across the lake in the most incredible, grand display. Then off we trundled to the local military camp for a few beers – as you do! – before again bedding down outside under the desert skies. Waking with the sun, it was a delicious local breakfast that got us up, before we headed to Danakil’s most otherworldly landscape. Dallol really looks like something from Mars and, as we walked around it, the smell of sulphur pungent in the air and our fingers pressing non-stop on our camera buttons, we were lost in another world, another planet. From steaming sulphur lakes, to towering salt mountains, salt pools appearing like cracks in an icy landscape, Dallol is a sensory overload, especially when you see, firsthand, how the local people work here in the boiling sun, eking out a living by mining the precious white resource around them. 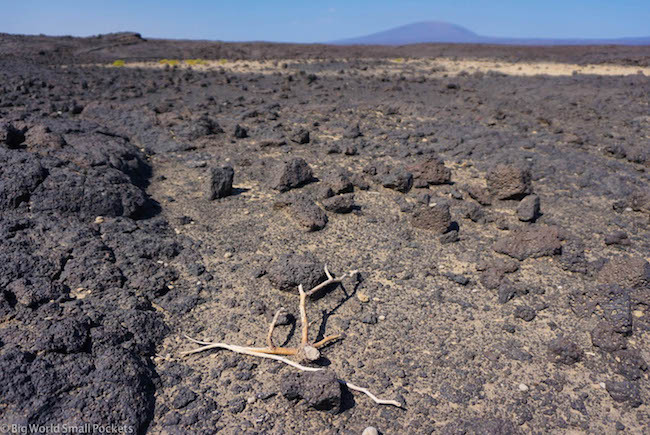 This is the hottest, driest place on earth. It is also one of the lowest. And in every way, it is like nothing else you will ever experience! Because that just about sums it up! Like nothing else you will ever experience! Travelling to Ethiopia’s Danakil Depression was probably the most bizarre, the craziest and the most rewarding thing I’ve ever done… and that’s saying something! This is seriously rough, adventure travel, but it’s worth every penny. It feels like the wild frontier of the world. 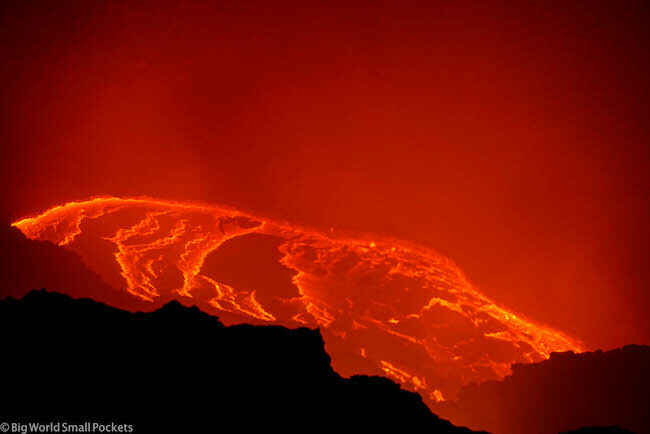 And I can’t recommend World Sun Ethiopia enough as the company to enjoy your Danakil Tour with. From the delicious, plentiful food, to all the provided tea, coffee, wine, beer and water, these guys had everything covered. Our drivers were professional and experienced, and our guides knowledgeable. 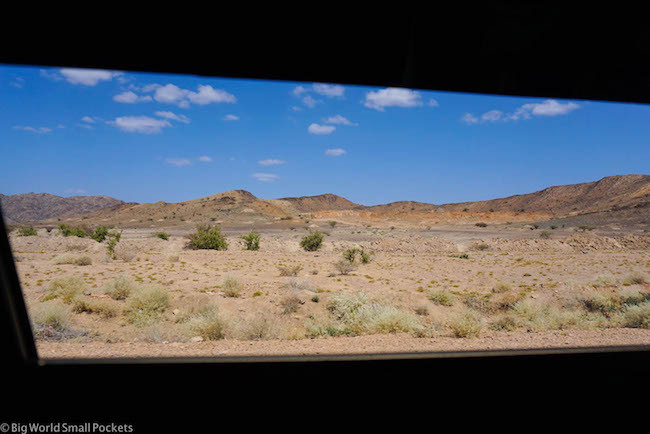 Security felt good and the 4wd vehicles well-maintained and comfortable – no mean feat in this environment! The good aircon in particular was a godsend! 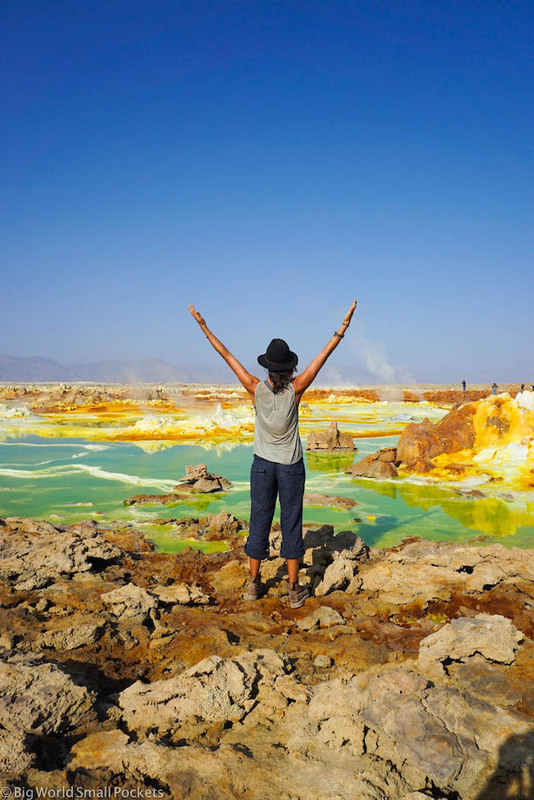 From the heights of Erta Ale Volcano to the depths of Dallol, the amazing contrast of Ethiopia’s Danakil is truly epic and an absolute once in a lifetime opportunity you can’t afford to miss! 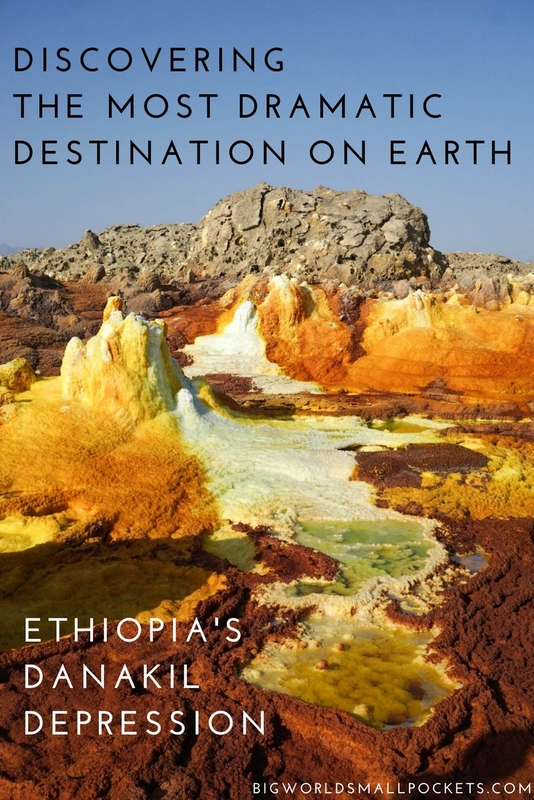 BOOK YOUR AMAZING DANAKIL TOUR WITH WORLD SUN ETHIOPIA AT THE BEST RATE HERE. Seems to be a great tour! I do want to travel to Ethiopia in March and want to do the same tour; but most likely will be travelling alone. Do they have tours you can join? Are these tours with daily departures? Can you say something about the price? Hi Matthias, this was a totally great tour, that I’d highly recommend. It’s fine to go as a solo traveller – as I was – they will put you together in a group with others, which is actually really nice as I met some fantastic people. If you just email World Sun with your preferred dates, they’ll arrange for you. March is coming to end of high season there, so tours might leave every few days, rather than every day, but just check with Negasi (the business owner first) and don’t forget to say I sent you! How much did you spend in total? For the tour? And what’s the food provided like? Thanks!